Fit is everything. Everything. Not labels, and not cost. Fit. A pair ten dollar pants cut specifically to fit your body is better than a pair of expensive pants that look like they came from the closet of Cab Calloway. Shirts, pants, jeans (yes, jeans) jackets…cut them all. It’ll cost you ten to twenty bucks for each, which is small price to pay for you to look like a million. 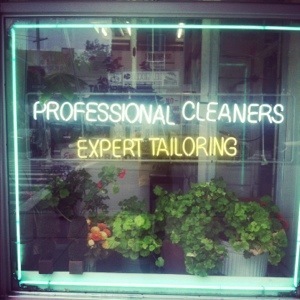 Just don’t go to the tailor above. Them jackleg crooks are TERRIBLE. They’re located on the corner of Marcus Garvey and Decatur in Bed-Stuy, Brooklyn. So, yeah…find a tailor…a good one. Note: If you’re in the hood and you go to a cleaners and you DON’T see that little old lady in there with needle and thread, that’s NOT the cleaners you want to use to cut your clothes. I knew better. I KNEW better.